This rich and creamy Carrot Tomato Chipotle Soup is an easy and delicious upgrade to your tomato soup and grilled cheese sandwich night. With just a handful of ingredients—some fresh, some from the pantry, you can easily whip this up on a busy weeknight. I came up with this recipe a few years ago when I was in the middle of dealing with some really tough things. At the time, I scribbled down the ingredients, took a few pictures, and planned to eventually write about it here because it was a really delicious soup. Although I never managed to write about it back then, I recently found the photos and ingredient list. I decided to make it again last night to see if we still liked it as much now as the first time I made it. This soup starts with onion, celery, carrots, canned tomatoes, chicken broth, and coconut milk. I added some chipotle paste for extra flavor and a touch of heat. The first time I made this, I had a tube of chipotle paste that Phil brought home from work (he works at Sur La Table, so he’s always bringing home specialty ingredients and gadgets to play with). If this is a product you happen to already have, use it. If not, a much cheaper option is to buy a can of chipotle chiles in adobo and puree it in a blender or mini food processor. You can keep the chipotle puree in a small glass jar in the refrigerator for a couple months and use it to flavor all kinds of things! Another option for storing chipotle paste is to freeze it flat in a plastic bag and break off little chunks whenever you need it. 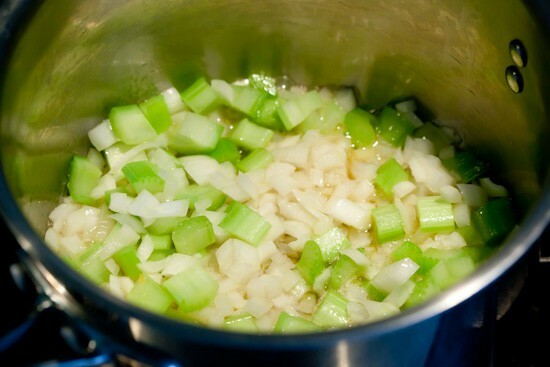 To start the soup, sauté the onions and celery in some olive oil or butter. Next, add the carrots, canned tomatoes, chicken or vegetable broth, and a spoonful of chipotle paste or puree. Bring it all to a simmer and let cook slowly for about 30 minutes to blend all the flavors and soften the carrots. This is the perfect time to assemble some cheese sandwiches! 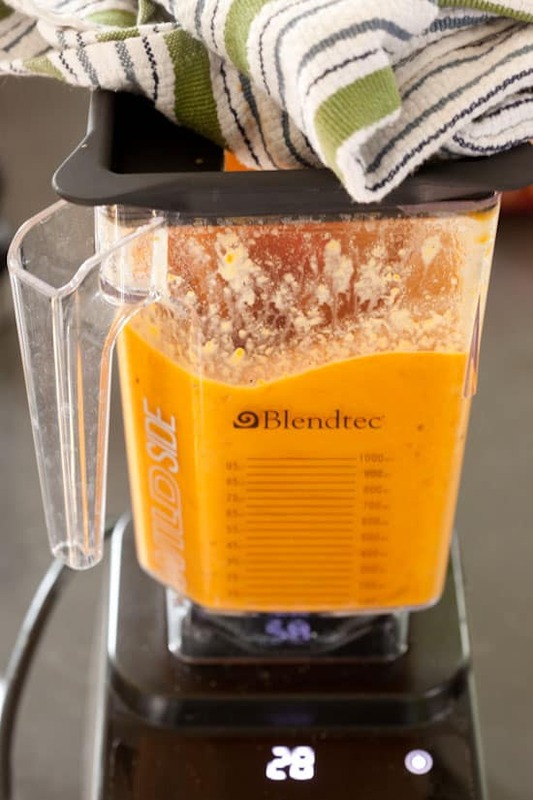 Next, you can puree the soup in the pot with a stick blender or carefully pour it into the container of a countertop blender or food processor. If you use a regular blender, make sure not to overfill it and leave the top open a bit to vent the steam or you will end up with a hot soup explosion. Once blended, just pour it back into the pot to keep it warm or serve immediately. And here’s my husband Phil, enjoying the soup three years ago. He enjoyed it even more last night because I served it with the parmesan toast shown in the first picture. We’ll have the leftovers today with grilled cheese sandwiches. I kept the flavors pretty simple in this soup, but feel free to add your favorite fresh herbs or spices. Curry powder would be delicious! I like to stir in some fresh chopped cilantro and a squeeze of lime at the end, but this carrot tomato soup is also delicious as is. 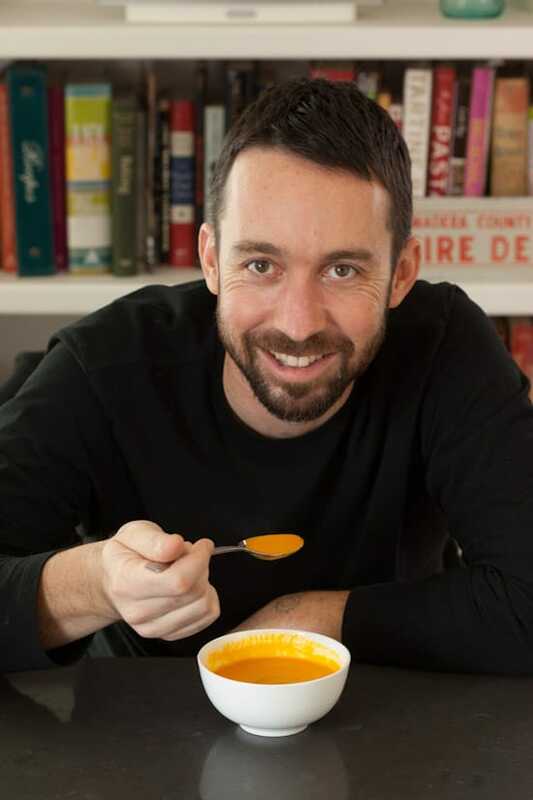 I’ve shared links to lots of other delicious soup recipes and carrot recipes at the bottom of this post below the recipe. Check them out! 1. Heat olive oil in a 3-quart pot over medium heat and cook onions and celery for about 5 minutes, stirring occasionally to prevent burning. You want the onions to brown a bit for flavor, but don't worry about softening them. 2. 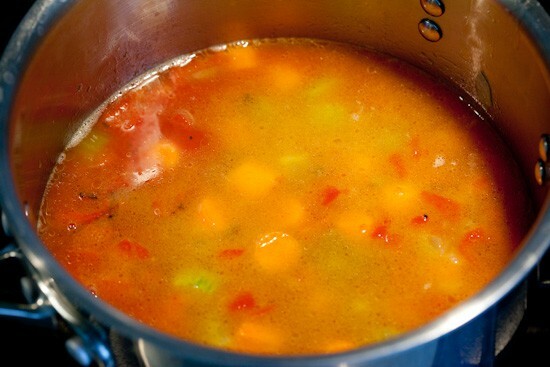 Add the carrots, tomatoes, coconut milk, chipotle puree, and chicken or vegetable broth. Bring to a simmer then reduce heat to keep the liquid bubbling a bit, but not at a full boil. Simmer uncovered for 30 minutes, stirring once or twice. 3. 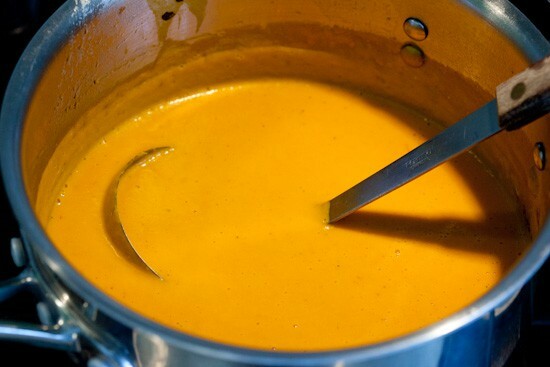 Turn off heat and puree the soup in the pot using a stick blender or let cool a bit then blend carefully in a regular blender. If using a regular blender, make sure not to leave the top open enough to vent the steam and do not overfill the blender. Return the soup to the pot to keep warm. 4. Serve with lime or lemon wedges and fresh chopped cilantro for garnish, if desired. I usually add a couple tablespoons of the puree to make the soup a bit spicier. Start with a small amount and add more, tasting as you go. You can also leave the chipotle paste out completely if you're making this for young kids. 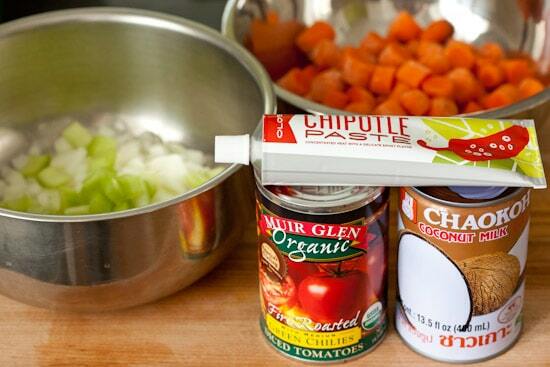 To make chipotle puree: Blend a can of chipotle chiles in adobo in a blender or mini food processor until smooth. You can keep the extra chipotle puree in a small glass jar in the refrigerator for a couple months and use it to flavor all kinds of things. Another option for storing the chipotle puree is to freeze it flat in a plastic bag and break off little chunks whenever you need it. This post includes Amazon affiliate links. Making purchases through these links won’t affect the amount you pay, but I may earn a small percentage, which helps support this blog and my family. If I write about products I have received for free or am ever paid to write about a product, it will always be disclosed. Thank you. No! doubt that this is a very good soup recipe but as you know we are in "Winter" so please try to share a chicken soup recipe.Thanks! Mmmm. Look delicious! Thanks for the recipe! This looks delicious! I will have to give this recipe a try! I hope you do give it a try, Emily! Thanks for stopping by! 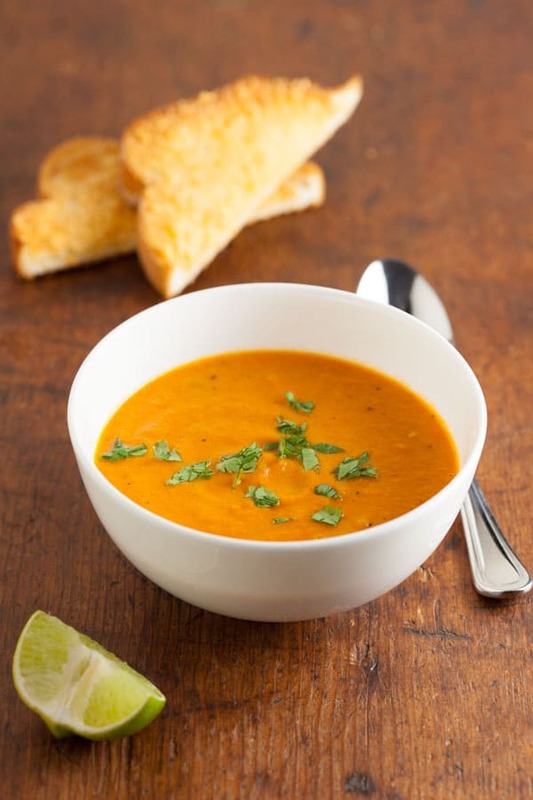 Carrot tomato chipotle soup is healthy and looks yummy.